Inspired by my friend Lori, I decided to join What I wore Wednesdays in an attempt to start dressing better and to start utilizing my closet appropriately. I have a ridiculous amount of clothing. Seriously, you could get lost in my closet. Yet, I always wear the same thing. I can't promise that I'll get through it or OR that I'll never wear the same outfit twice, but hopefully this will help me think outside of the box a bit more (ahem, which is hard to do at 6:30 in the morning). Disclaimer: I'm taking the pictures with a crappy blackberry for now, so don't expect a work of art here. 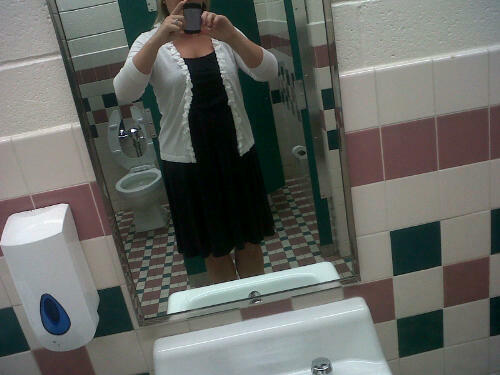 What I wore last Friday (or don't you love pictures that include an elementary school toilet)? I'm not showing you. I was tubing and in a bathing suit. That is for my eyes only. I was camping. I wore sweatpants with a side of mud. 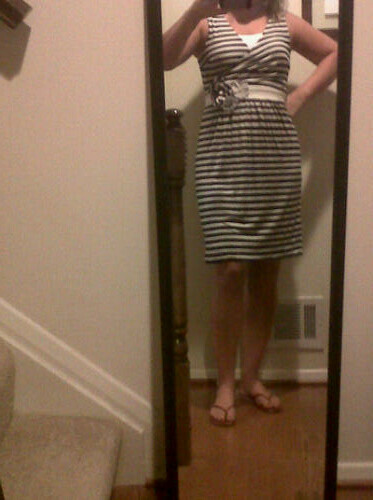 What I wore Tuesday (or I'm a rebel and wore flip flops to work. At least they were red patent leather). Every teacher can recreate (and has many, many times) this look-- colorful cotton dress, jean jacket and some variation of flat shoes. It's a life saver. What I've noticed: I do own more than 2 pairs of shoes but I prefer flats when I'm at work. My feet don't even know what heels are anymore. It's tragic. I love this idea! 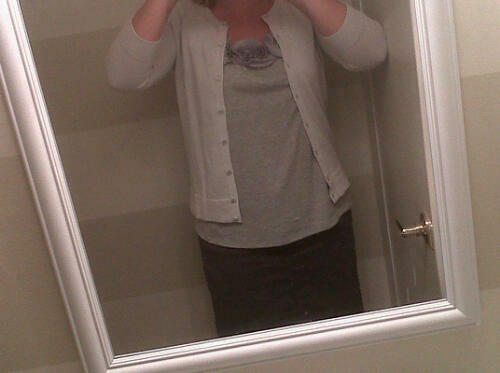 My kids came today for an hour, so I had to dress like a grownup! They come in for real on Monday. I've got my first day outfit picked out. Not sure past that. Cute! I have that same ON ruffly cardigan in several colors! I love it! 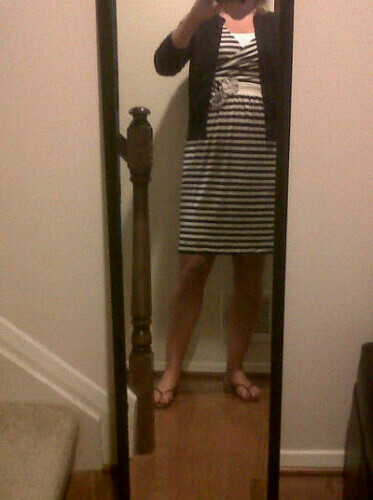 love the striped anthropologie dress! very cute and easy to wear! Ha! I may have worn a cotton dress, Jacks, and a jean jacket today. 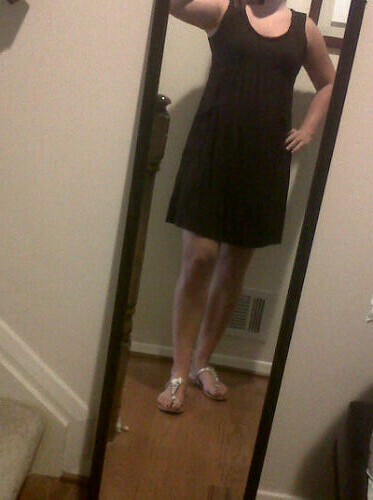 And will wear some variation for the rest of the time it is 90+ out. love the outfits! and have many of the pieces you're wearing! I especially love the green loft dress, definitely wear that a bit!! Cute dresses! I have that same ruffled cardigan in black. Our school is very casual so I wear flip flops all the time and I'm usually one of the most dressed up because I'm always in a dress (even on Fridays right now). 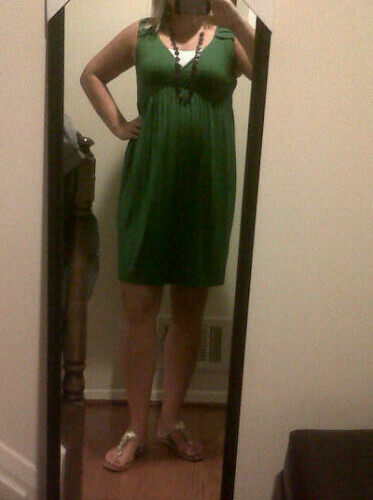 I hardly wear a heel anymore and I laugh when student teachers come in them! They don't really work on the playground. LOL, let me clarify! I love all the outfits! Especially the striped dress! I loooove that Anthro dress!!! I love it..."I wore sweatpants with a side of mud." Your outfits are great though and the colorful dress with a jean jacket is a staple in every girl's wardrobe! I am hosting a little fun thing for those of us that have closets full of clothes that we wear the same five outfits out of-30 different outfits in 30 days. I would love for you to jump on board! I LOVE the anthropologie dress! And.. yes, it's tragic that your feet don't remember heels. I tried wearing them twice this school year and both days I was in a hold AND had to kick them off to transport a child (screaming and kicking, natch) down the hallway. love the cardi! I have the same one from Old Navy. I love your Anthropologie dress - it's just gorgeous. Lucky you. You look great and I like the Elementary Toilet touch - nice !!!! I don't particularly like Anthropologie, but I love that dress.